The Starfinder Roleplaying Game arrives in August 2017, but the first aliens are landing right now! Within this top-secret dossier, you'll find a dozen otherworldly foes both bizarre and familiar, from the asteroid-dwelling sarcesians who ride solar winds on wings of light to technomagical undead horrors capable of ruling forever as the sinister Bone Sages of Eox. While all the creatures in this book are designed for use with Starfinder, all can be easily converted for use with Pathfinder, so there's no need to wait until August to start battling invaders from space! A dozen alien creatures from throughout Golarion's solar system. Player-race information to let you be the alien, from the atrophied psychic creatures called contemplatives to the bug-like haan who float across gas giants on balloons of spun webbing. Instructions for easily converting Starfinder creatures into Pathfinder foes. Sneak previews of some of the new abilities and rules systems featured in Starfinder. Take your Pathfinder campaign to the stars with this official manual of Starfinder aliens! 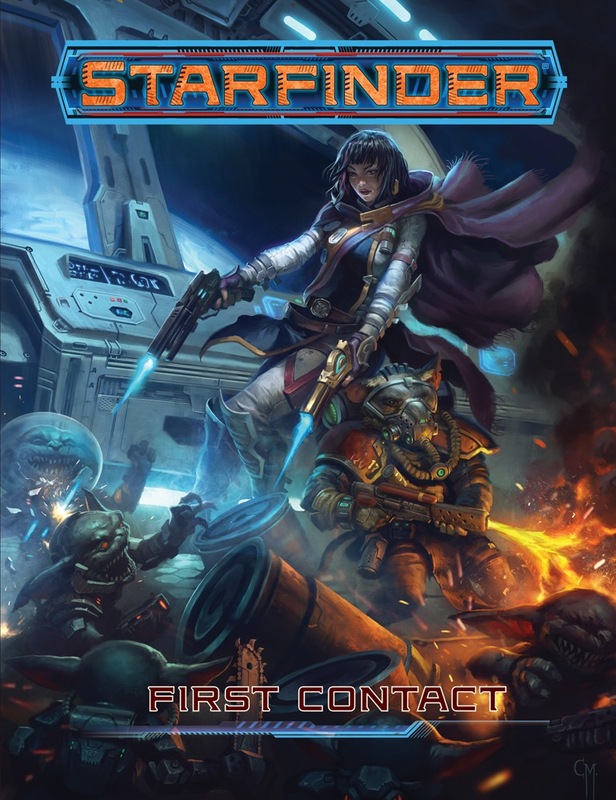 Note: Starfinder First Contact was created for Free RPG Day on June 17, 2017. The $5.00 print edition and a free download version will become available on paizo.com beginning July 1, 2017. Space Goblins: say no more, that is worth 5 stars. More seriously, a nice starter for Starfinder. Interestingly, rather than the usual short adventure to introduce a new game this taster work presents a mini-bestiary of new alien races that can be encountered in local space. Given the similarity of the new system to the Pathfinder one on which it is based, these creatures can be used in a Pathfinder game. However, there are some differences between the two systems and a couple of pages are devoted to explaining them. Most of the changes are relatively trivial and should only trouble those who obsess point-by-point. How to tweak them is also explained. Naturally there are some new abilities due to the science-fantasy setting, and these are also explained here. Then it's on to the creatures themselves, eleven of them. Needless to say, a Space Goblin is included. Legend has it they are descended from some regular Golarion ones who stowed away on an early spaceship, and indeed they haven't changed from their ancestors... and are mostly found on Absalom Station although they do travel the spacelanes as well. Being space-FANTASY many of them sound pretty much like any other monster just with a few space-faring tweaks, and things like undead are included. One of the pleasures of playing any futuristic game is having the chance to play an alien. Some of these creatures have the potential to be used as player-characters, and these are provided with a section of information called Racial Traits designed to facilitate generating characters of that species. It's not quite as straightforward as deciding to play an elf or a dwarf, but it can be done. Not Perfect, but Worth the Price! First Contact was Paizo's giveaway for "Free RPG Day" in June of 2017. The book is a fifteen-page "bestiary" of sorts, with several new creatures a Starfinder GM can throw at players. But players should be interested too, as the book contains four new playable races that expand the options given in the Core Rulebook. The book is available for a free PDF download here, or a print copy can be purchased for just $ 5. I wouldn't normally go through every entry in a rulebook, but since it's only fifteen pages, it shouldn't take long. First, a fantastic cover by Caio Maciel Monteiro of Navasi (the Envoy Iconic) and Quig (the Mechanic Iconic) blasting away at some space goblins. I especially like Quig's flamethrower. The artwork is reproduced sans logo as the inside back-cover. The inside front cover is a chart showing the planets in the solar system where Golarion used to exist, along with indications as to where the various creatures in the book hail from. It's a nice shorthand representation. Oddly, it's titled "Starfinder Monsters in Pathfinder" which I think would be confusing to many readers since Starfinder is a new game (even though some of it could be easily converted to Pathfinder). The first page is a table of contents, indicating that the book will cover 11 new alien species. There are new "Monster Reference Symbols", which are icons that are prominently featured in each monster entry, indicating whether it is a "Combatant" (strong physical fighter), "Expert" (skill-based creature), or "Spellcaster" (self-explanatory). I like this system of symbols better than the more comprehensive but harder to decipher system used in the Pathfinder bestiaries. The book starts with a three-page Introduction. The first section is "What's Different", which briefly summarizes how Starfinder works differently than Pathfinder. For monster creation, one of the big changes is that they're not built with the same rules that PCs are built like in Pathfinder: instead, there are separate, much faster monster creation rules similar to the optional system introduced in Pathfinder Unchained. I have to withhold judgment on whether this is a good move or not, but I know there's a lot of controversy about it in the forums. The section goes on to talk about how ability scores are no longer listed (just modifiers), there are two types of armor class (Energy Armor Class for energy attacks and Kinetic Armor Class for physical attacks), feats are listed only if they can be actively used instead of just providing static modifiers (a great idea), weapons and attacks are now listed with the type of damage they do and there are no confirmation rolls required for crits (which will make sessions faster-paced and potentially more lethal), various types of senses are streamlined, CMB and CMD is no longer a thing, and disease and radiation use the alternative rules introduced in Pathfinder Unchained. You can see that the designers of Starfinder have worked hard to simplify, streamline, and modernize the rules. Interestingly, the Introduction goes on to provide a preview of some class abilities from the Operative and Soldier classes: much of this information will become redundant (and could be tinkered with) once the Starfinder Core Rulebook is widely available, but for now it's a fun away to see what sort of style of abilities the classes have. Operatives (at certain levels) can get a cool "Cloaking Field" ability that essentially allow them to hide in plain sight, a "Debilitating Trick" ability to make an opponent flat-footed or off-target, a "Trick Attack" ability to catch an opponent flat-footed and do extra damage, and an "Uncanny Mobility" ability to avoid attacks of opportunity from a particular enemy. The Soldier can get a "Grenade Expert" ability to increase the range increment of grenades and manufacture them without paying for them. On the whole, I really like what I see: they're new and different, but still clear and easy to follow for people familiar with how Pathfinder works. Finally, the Introduction talks about two new Universal Monster Rules ("Limited Telepathy" and "Unliving") and three new weapon abilities. This latter category will be great fun for players and GMs alike, as every weapon has a special ability that activates on a critical hit. The ones discussed here are Arc (the energy blast hits a second enemy), Burn (the target is set on fire), and Explode (boom!). Now, on to the new creatures. 1. Bloodbrother. Look at the artwork closely and you see why this creature is so cool (and creepy). Basically, it can grab people and place them within its ribcage to start draining their blood (Con damage). It's a really cool concept, though there's not a lot of information about ways a character escapes once within the rib cage prison. 2. Contemplative. First introduced in Distant Worlds, the Contemplatives of Ashok are essentially enormous telepathically/telekinetically empowered brains with vestigial bodies attached. They're definitely very "alien," but the best part is that they're a playable PC race. My only critique is that there's very little background on them (three short sentences). 3. Ellicoth. These are enormous (Gargantuan) creatures that live on the planet Eox and devour undead while giving off a radioactive aura. They have a fun ecological niche. 4. Space Goblins. Perhaps my favourite entry in the book, as the artwork is just a perfect encapsulation of goblins (I especially like the band-aids holding together the cracked space helmet!). I actually really like the special abilities space goblins receive, as their well-known fondness for scrounging, tinkering, and using homemade weapons comes to the forefront. 5. Haan. These are weird, giant bug creatures that fly by means of crafting personal balloons out of webbing and inflating them with jets of gas they can emit. Hey, it's science-fantasy so you may as well think outside the box!. They're also a playable race, and are large-size creatures which is definitely a shift from the Pathfinder norm. They don't do a lot for me, and it's hard to picture what their culture and personalities would be like, but hopefully that'll be expanded on later. 6. Ksarik. Mobile quadrupeds that are supposed to be plant monsters, but neither the artwork nor the write-up really makes the creature feel that way. These are definitely "monsters for monsters-sake" creatures that PCs won't feel the need to try to negotiate with or befriend. They have an interesting but somewhat complicated ability to adapt their bodies to that of creatures they're fighting--I'm not sure how this would play out in a game, but it definitely allows them to be unpredictable opponents. 7. Necrovites. "Space liches" comes to mind, as these residents of the undead planet Eox have mastered both magic and technology. We see hints to a lot of cool tech (like an "Eoxian wrackstaff" and a "d-suit IV with gray force field") and a variety of special abilities, but there's only 26 words of background/description. 8. Orocoran. An excellent write-up of a creepy aberration from Aucturn. Orocorans can spew vomit that causes targets to hallucinate and then, while targets are disabled, the monster stabs them with a blood-sucking proboscis. 9. Security robots. Although security robots may not seem particular exciting, including them here was an excellent choice as I imagine they'll get a *lot* of use by GMs in a variety of adventure scenarios. The write-up is quite detailed and provides some instant insight into Absalom Station, and even includes a little adventure hook at the end. The shoulder-monster turret is a fun touch. 10. Sarcesian. Last of the playable races, and another large-size creature. Interesting to see how that shakes out in gameplay, as having 10' reach is a big advantage. Sarcesians are spindly humanoids specially adapted to survive short periods in vacuum, and can even grow energy wings to move through space. The idea is interesting, but it's hard to picture what they're like in terms of personality. There's a notorious (and humorous) typo here, as the creature's rifle is listed as doing "1d810+5" points of damage! 11. Space pirates. Another smart addition, as space pirates are a natural anytime a random encounter to shake things up is needed. The artwork is a bit bland here, but we are treated to two stat blocks (a CR 1 "Space Pirate Crew Member" and a CR 4 "Space Pirate Captain"). Overall, the artwork is quite strong and definitely up to what we expect from Paizo: in addition to the aforementioned cover, there's several other stand-out pieces. I know layout and space constraints make detailing new creatures quite challenging, but I'm not sure if the right balance was struck in some of the entries: a two-page spread would have been better for some of the creatures, even if it meant fewer overall. As a "Free RPG Day" product I think Paizo could have made a better choice than a mini-bestiary, as there wasn't anything readers could do with the book other than wait several weeks for Starfinder to come out. Still, once the Core Rulebook is out, this free little book will be almost essential in giving GMs some adversaries for the PCs. And hey, it is a free download, so one can't really complain! The insight to mechanics is interesting, the creatures are unique, and the playable races are far more ambitious than one would expect from a preview of a game yet to be released. Oh, and the art is straight-up top-notch. I really hope this quality is continued in the upcoming Starfinder products! The aliens look great and the bits for classes are interesting. Wish there has been some info on ships. If the hardcover lives up to the promise of the sneak peek it will be a staple with my gaming group. Announced for Free RPG Day 2017! Image and description are final. The cover image is just beautiful. Is the flame-thrower guy also a goblin? I can't tell. Nope, that's an armored ysoki. Some kind of goblinoid race, or something totally different? The Ysoki are ratfolk from the planet Akiton. They've been part of the Pathfinder campaign setting for years. Thank you. Kind of hard to remember every race. Will there be light starfinder rules available for free RPG Day? Looks like they are fighting goblins in space suits, so space goblins. I agree, but if we are using the gunslinger rules then everything goes by touch ac. I mean if it is effectively a Season 6 PFS adventure I'm fine with that but I am looking forward to this game and look forward to see how it is different. Can I pretend I'm from ten years in the future and start whining about the mystery of what happened to Golarion? Just kidding. I didn't think I could get pulled into another new RPG, but Starfinder will get my money out of the gate. Love love love that cover! But i can't wait to play! MURDERHOBOS ... IN ... SPACE !!! I want to see Free RPG Day 2018 - We Be 5pace Goblins! It would be nice to actually have alien races on the cover then the same ones we have seen many times before. Well, my bronze causing, I suppose that the same pattern used in all books was used here as well. Do you remember what Mr. Jacobs said about the monsters in the cover of Bestiary 6? Even though it's the first time we have seen a ysoki on a cover - that could already count as a new alien race - I'm close to sure that space armored goblins in frenzy and a beautiful woman mercilessly shooting is already attractive to the public. An unknown random alien race wouldn't be so eye-catching, specially for pathfinder players making the transition into Starfinder. The Goblins are so iconic, aren't they? Well... Alas we got a beautiful cover, with a fresh new iconic in it - that's the Ysoki iconic, isn't it? Now that I think about, how the heck goblins manage to put themselves in space suits without somehow exploding themselves? .-. She is not being very diplomatic. There are many different forms of diplomacy in the galaxy. The method that Navasi is using on the cover here is #3. There are more, but I don't have the time to list all 108 of them. incidentally, the ysoki is using method #13 - flambe. Bioware games have gotten by with just those three for ages, why not keep that train rolling? Flame Thrower could totally work in a low oxygen enviroment... the fuel used just has to supply its own oxygen, like burning metals. But why the rectangular bore for a flame thrower? maybe two lines of components that burst into flame when they mix on exiting from the weapon? Love that the goblin's ears are being bent by the comical fish bowl helmet. Makes me think about how things with natural attacks will take to wearing environmental suits. "go ahead and make that bite attack... and roll Fort vs. vacuum of space." Disappointed that both of Navasi's guns are making the same blue burst kind of shot there, i was hoping they operated on different technologies and we'd have a physical and a laser or magic based weapon. I imagine stepping foot on alien worlds without the right kind of protection could be pretty painful(for any number of reasons). Still though, the sci-fi elements of the setting mean you can have encounters with the hive on derelict space stations, arrive on a world where simian life has evolved to dominate civilization after the fall of the old civilization, or even a galaxy far far away where evil empires massive battle-stations that can kill planets has absolutely massive weak spots. In all fairness, i am going to be saving money for this. this is really cool. Hypergolic fuel/propellent are liquids that spontaneously combust upon contact. They are mainly used in rocket engines. A goblin with a chain sword. Finally technology they can relate to! There's some artistic license going on here. Her guns are definitely NOT exactly the same! To make anything Sci-fi you add Laser or Space to it. Bug-like race called haan sounds interesting. A playable version of the contemplative?! Three playable races in here, out of about 12 monsters. I like that ratio a lot. Scratch that, 4 playable races. I forgot about the Haan. Were do you see 4 playable races? To be fair, it was the 70s, everyone shot first. ... Except there aren't any brick-and-mortar FLGS in my country so no FRPG for us. Will the PDF download be available soon after or will we have to wait until August to play? I am beyond psyched for playable comtemplatives. Nothing like playing as a hyper-intelligent, atrophied brain monster!